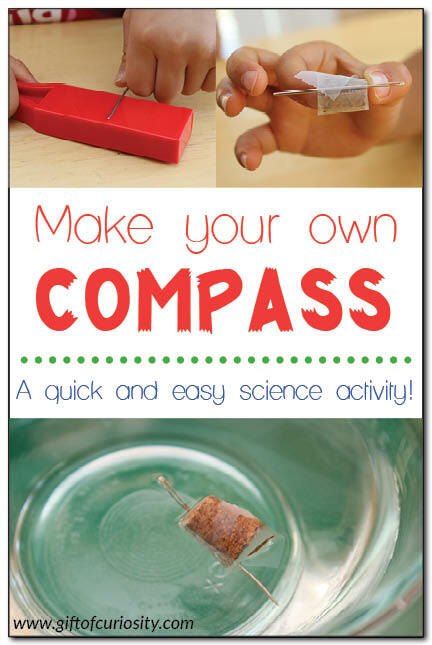 Do you know how to make a compass? 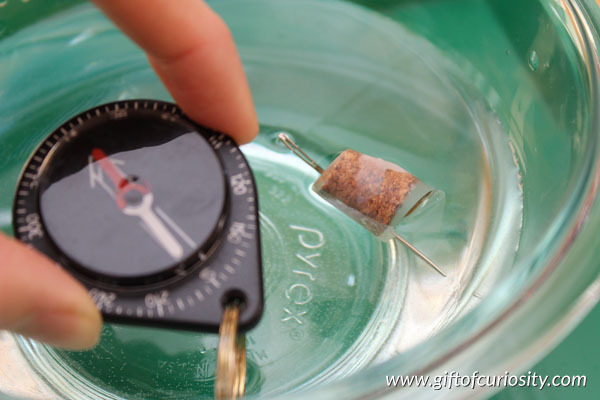 I had long heard that it was possible to make a functioning compass using a magnet and a needle, but I had my doubts about how well it would work. Well, it turns out that my doubts were misplaced because it was surprisingly easy do make a compass using some simple materials from around our home! As part of our geography studies, my kids have been learning about directionality. Since they had worked with a real compass and knew how to use it, I thought it might be fun for them to try making their own compass. Fortunately, not only was it fun, but it was really simple too! The first step was to rub the needle against the magnet. I don’t know the minimum amount of rubbing required, but both of my kids rubbed for about 10 or 15 seconds. The purpose of rubbing the needle against the magnet is to magnetize the needle. As explained in this article, a compass is like a lightweight magnet that detects the magnetic fields of the earth. The magnetized needle of a compass, then, always points to magnetic north. 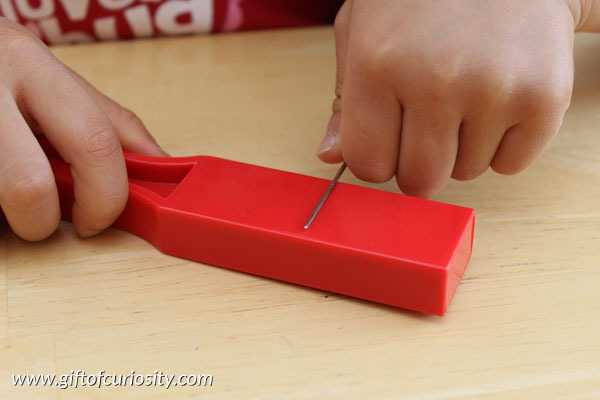 By rubbing our needle against a magnet, we magnetized it just like the needle of a compass. The second step was to tape our now magnetized needle to something that floats. 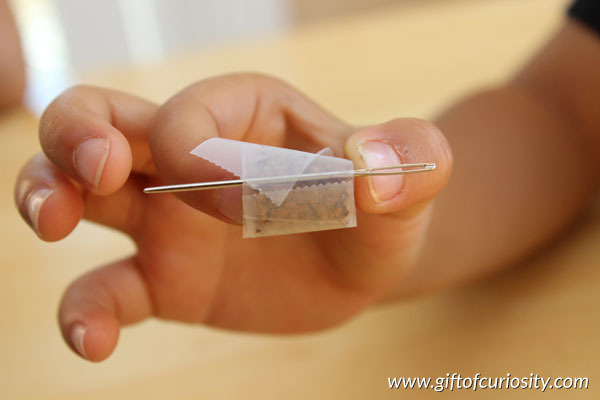 We had a small cork laying around, and we used scotch tape to tape the needle to the cork. 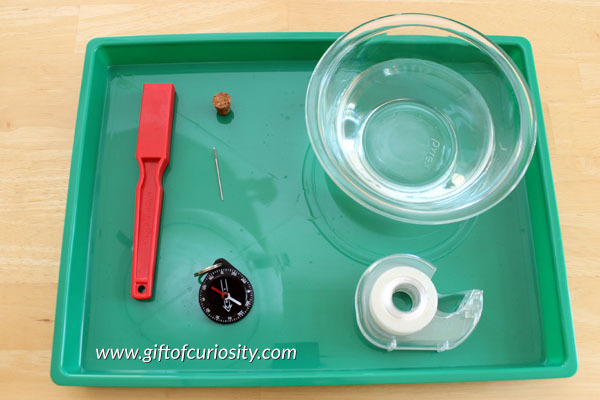 Once our needle was secured to the cork, we dropped it into the bowl of water. We watched in amazement as the needle briskly turned so that one end was pointing north. Wondering if it was a fluke, we dropped the needle in over and over again, and each time the result was the same. The needle would turn until it was pointing north. And that is how you make a compass. Easy peasy! This was a great post! I will definitely be sharing this. Thanks for sharing.